The Oculus Touch controllers are exactly what the headset needs to provide a more immersive VR experience, but the lack of room-scaling right out of the box means that the Vive still has the upperhand. Update: At the Oculus Connect 4 keynote held on October 11, it was revealed that price of the Oculus Rift and Oculus Touch bundle has been slashed permanently to $399 in the US. That makes this bundle only $200 more than the newly revealed standalone budget headset, the Oculus Go, which will retail for $199 (about £150, AU$255) when it ships early next year. However, you also now have the option to wait until early 2018 for the tether-less Project Santa Cruz headset when it becomes available to developers. Sales numbers: You can either take them or you can leave them. You can cite them when things are going in your favor and you want everyone to latch onto that momentum (ahem, Sony’s 40 million in PS4 sales) or you can totally hide them from the public. We’re talking about sales numbers because earlier this month, a video game market research firm, SuperData, released its sales forecast for the three major gaming headsets – Oculus Rift, HTC Vive and PlayStation VR – for 2016, and the results weren’t favorable for Oculus. OK, ‘unfavorable’ is an understatement. They were downright awful. While the firm expects PlayStation VR to sell 750,000 units in the time since its October 13 release date, Oculus is expected only to cross the .36 million mark –a whole six months after its release – before the clock strikes midnight on January 1, 2017. There are any number of reasons why that might be the case. It could be because Oculus Rift is still relatively expensive for a headset ($600 / £499 / AU$859). Another might be that it requires a pretty decent PC to run games. A third reason, and the one that we’d put the most stock in, is that it didn’t ship with motion controllers. Which means for the past six months, the Rift’s main competitor, the HTC Vive, has had a serious advantage on it – the ability to walk around and interact with objects using their own two hands. But with the arrival of the Oculus Touch controllers the tides are about to turn, and we've had a chance to try the controllers out in our own homes and given access to a number of Touch-compatible titles. We’ll discuss the entire experience at length below, from the somewhat arduous setup process to the incredible first demo as well as some of our favorite games so far, but let us just say this first: The Oculus Touch may be late, but it just might be the thing that saves Oculus from getting left behind. Before we dive too deep into the pros and cons of Oculus’s final motion controller hardware, however, keep the following information in mind: The Oculus Touch will retail for $199 (£189 or around AU$265) when it goes on sale on December 6. If that $199 price sounds like a lot, it's because each controller package will also include two games, VR Sports Challenge and the Unspoken, as well as a second sensor to go alongside the first that’s required for the headset. For what you’re getting it’s a surprisingly good deal. Oculus has said extra sensors will cost about $70 by themselves and the going rate for an Xbox One or PS4 controller is about $50. Two controllers, one sensor and two games for the price of a Nintendo 3DS XL? We’ll take it. Once you’ve got controllers in hand it’s time to connect your new sensor to an open USB 3.0 port on your PC and sync the controllers. In short, the setup process isn’t nearly as smooth as it should be. We’ve had problems getting Oculus up and running in the past, and the Touch can be just as finicky as the headset itself. Like the HTC Vive, you’ll need to use both the motion controllers and the sensors to map the area around your play space. Oculus’s advice is that the sensors should be placed in parallel on your desk and be facing forward – a very different setup compared to the HTC Vive which recommends that you place its wireless sensor arrays on opposite ends of the room. Now, if you had a USB-to-USB extension cord and/or a third sensor, you could extend the sensors so that they could be placed for 360-degree, room-scale tracking, but the controllers don’t ship with that cord, so you’ll need to shell out extra for that experimental experience. Instead you’ll have to settle for a two sensor, front-facing setup. The reason you’re mapping out the room is to set up a chaperone – a series of virtual blue lines that appear inside the headset to keep you inside the play space and away from anything fragile or potentially hazardous. It’s almost identical to the one used on the HTC Vive, and that’s OK – there’s no reason to fix something that isn’t broken. Now that everything is setup and you have somewhat of an idea of what you’re going to see inside the headset when it first starts up, let’s talk about the controller itself. Everything considered, Oculus Touch follows a similar design style to the HTC Vive’s motion controllers. For example, both end in a plastic ring, which is used by the cameras to track the controllers, and both offer grip and trigger buttons. 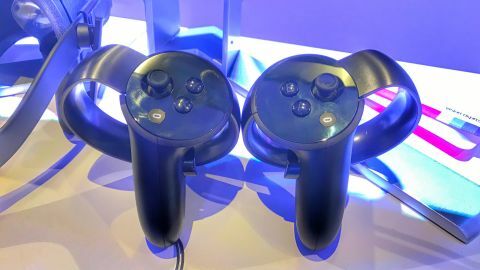 Where Oculus Touch differs slightly is that it’s a bit smaller than the Vive’s pads – the rest of the controller is around the size of one half of a gamepad – and sports two letter buttons, an analogue stick, and two triggers. Another difference is that, unlike the Vive, the left and right Touch controllers are actually different. The button layouts are on opposing sides, and while the right controller has ‘A’ and ‘B’ buttons, the left has ‘X’ and ‘Y’. Fundamentally this doesn’t change much about how you end up using the controllers, although it could cause problems further down the line when you need to start replacing controllers. The third big point of difference is the number of buttons. Oculus sports extra buttons on the face of the controller, a trigger, menu and start buttons, a set of grip buttons that hang off the inside wing and a small touch sensor for your thumb next to the joystick. What that means is the Touch can tell what almost every finger is doing at a time. What that means is the Touch can tell what almost every finger is doing at a time. Want to give someone the OK sign in a social game? Place your thumb on the sensor and press the trigger with your index finger. To give someone a thumbs up, all you need to do is press the the grip and trigger buttons and move your thumb away from the top sensor. Want a gun shape? Grip button only. Use one finger to point? Press the grip and put your thumb on the sensor. The Vive might offer a touch-pad, but Oculus Touch offers a range of additional hand gestures that the Vive simply isn’t capable of reproducing in its current form. But every wireless controller needs a battery. And while HTC has opted for a rechargeable lithium ion one inside of every controller, Oculus instead uses good ol’ AAs. That said, you can get about 30 hours of battery life on a single charge, and longer if you close the Oculus Rift app in between uses. Oculus has promised the world 53 Touch-compatible games on Day One. The games will be a mix of completely new titles, games that were already out on Oculus but now have Touch support and games ported over from the HTC Vive and PlayStation VR. Taken on their own, it’s a varied and actually fun bunch of titles from the wacky, multiplayer shooter Dead and Buried from Oculus’s own game studio to the self-explanatory Fruit Ninja VR and even an unofficial successor to Wii Sports called VR Sports Challenge. The majority of games we played over the last week were exceptionally fun and immersive, and compared to the Rift’s original launch are downright near Game of the Years. Heck, even Oculus Touch’s opening demo – dubbed Oculus First Contact – does double duty as a great tutorial as well as an epic ’80s homage. Set in Matt Damon’s space trailer from The Martian that’s been loaded to the brim with retro tech, you’ll meet a floating Nintendo R.O.B. doppelganger who’ll give you floppy disks to load into a 3-D scanner. The printer then spits out laser guns, toy rockets and music instruments for you to play around with before moving on to the next, even-more-exciting object. We could’ve spent hours just fiddling around with the myriad toys and gadgets, happily paling around with R.O.B. 2.0. But that would’ve meant not seeing the dozen-or-so other amazing titles. There are too many great titles to name, let alone give the recognition they deserve, so instead of enumerating all your options we’ll just highlight a few of the best experiences. I Expect You to Die While this one’s far from an Oculus-exclusive – it’s available on both the PlayStation VR and HTC Vive – we couldn’t write this review without testing Schell Games’ white-knuckle spy thriller that’s two parts 007, one part puzzle game. In it you’ll need to use insanely convoluted deductive reasoning and expert reaction times to complete your nonsensical and rarely explained mission objectives. I Expect You to Die would have worked without the Touch controllers, but actually holding each item in your hand makes the game all that more immersive and satisfying when you finally figure out what wacky solution the game wants you concoct. VR Sports Challenge VR Sports Challenge is best described as the spiritual successor to Wii Sports. It puts you in the ice skates, basketball shoes and football cleats of an unnamed athlete as you try to win over fans and outscore the computer. Whether you prefer to use the controllers to shoot a puck or a basket, VR Sports Challenge does an excellent job matching remedial hand-eye coordination to impressive on-screen feats. Speaking personally, we found football a bit more enjoyable (read: accurate in hand tracking) than the other two sports, but we could see fans of those sports getting a kick from coming home after a long day at practice and relaxing with a less intense form of their favorite sport. Fruit Ninja VR Probably the most self-explanatory game on the list, Fruit Ninja VR transforms your hands into katanas as you slice and dice your way to the top of the leaderboards. The Touch controller – and the Oculus Rift itself – adds a certain level of immersion that you just won’t be able to find on a smartphone. Arcing your sword just so to land that seven-fruit combo feels amazing, and an integrated leaderboard means you get to compete with your friends (again) to see who’s the best comestible samurai. All said, Fruit Ninja VR offers a sensations in the world of VR that just can’t be matched in the real world without having to spray pulp off your driveway. Kingspray Sticking with that spray theme for a second, Kingspray is a game about a decades-old street art: graffiti. There’s no real end-goal, no points and no competitive leaderboard – just unlimited creative freedom. In the past we’ve found many of the VR art-focused apps to be a bit bland, but Kingspray does a good job of making you feel like an unadulterated hoodlum without the fine that tends to happen when you’re caught defacing public property. Dead and Buried The last game we’ll call out comes from Oculus’s own development studio. Dead and Buried is a multiplayer shooter affair that has you and up to three friends dueling with six-shooters. The goals are straight-forward here – avoid getting shot – but the game itself is actually really thoughtfully constructed and a perfect match for the new motion controller. If you want a fun competitive shooter and can’t wait for Infinity Ward to bring Call of Duty to virtual reality, Dead and Buried will get you your firearm fix in the meantime. The Oculus Touch took a long time to get here, but we can now say with the utmost certainty that is was well worth the wait. Offering better finger tracking than HTC Vive alongside more overall buttons and slim, form-fitting design, the Touch is the best motion controller on the market that’s tied, unfortunately, to hardware stuck in the number two spot. When developers figure out how to leverage the Touch’s expanded range of gestures things will really get good. But, for now at least, it’s the most versatile controller on the market and our new favorite. Everything that’s wrong with the Rift has nothing to do with the controller and yet, because they’re inseparably tied together, the Touch inherits the headset’s shortcomings. One of those problems is that Oculus doesn’t package every controller with the proper equipment for room-scale VR. You’ll either need an extension cable for your second sensor and/or opt for the third sensor for more accurate 360-degree tracking. The second problem, and the one that we feel like Oculus won’t address until the second generation of this hardware, is that the Touch needs to be a pack-in peripheral for the headset itself. It’s the greatest optional accessory – but, so long as it stays optional, it likely won’t see the kind of consumer adoption it needs to get developers to embrace the technology full-bore. That’s bad both for Oculus and the industry as a whole. It probably goes without saying at this point, but Oculus Touch is the missing link for the Rift. It enhances the experience in so many ways, so much so that it feels like we’re finally using the Rift as it was meant to be played. Its shortcomings aren’t based on anything wrong with the controller itself but rather the overall design of the system. HTC’s sensor arrays still offer hand tracking when compared to the two-sensor system Oculus has cooked up but, when it comes down to mapping individual fingers, Oculus Touch has the edge here. That being said, Oculus might be competitive in the hand tracking space if you add a third sensor to your setup, but because Oculus doesn't provide a third sensor in the box it's unlikely to be a setup that's used by most people. Regardless, if you’ve already bought into the Oculus ecosystem at this point, you absolutely need to pick up the Touch. If you haven’t decided on a headset, you should still consider the HTC Vive first and then come back to Oculus after you’ve given that a shot.